To make sure you get the best deal we'll show you great prices from all of our drivers, including Harley Transport, if they're available on the day of your move. Have a question for Harley Transport? No problem, send them a message and they'll email you back as soon as possible. If you have a more general question you might find it answered in the FAQ, or you always contact one of our brilliant customer service team. * Harley Transport won't be able to see your email address. 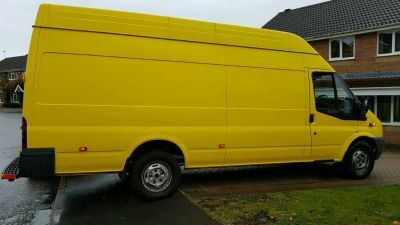 I am a professional delivery and removal business with a clean Panel van and drivers with appreciable amount of experience in furniture removals, events transportation ranging from delivery to/from Excel London exhibition centre, Olympia exhibition centre and others across UK. We cover everywhere across the UK. We are covered with a Goods in Transit and Public Liability of over two million pounds, giving you rest of mind when delivering/transporting your goods. Harley was lovely, he did arrive 20 mins late due to traffic but we still got the move done in the two hours. Got all our stuff in the van and drove considerately. The driver was came 11 minutes later than expected (which isn't an issue). After getting everything and getting to the final address, the job was completed 13 minutes later than expected. Although he arrived 11 minutes later than the booked time, I was still charged for an additional 30 minutes. Also, I had chosen the 1 flight of stairs in the booking which charged me more, but he was rushing once we got there and ended up placing all my things at the base of the stairs and I carried them up myself. So all in all, I ended up paying a stairs charge and an additional 30 minutes, for no reason. The job went over by about 22min, and I was late about 9min. If the customer has asked for a consideration which I do give, then I would have known what to do at that point in time. As per the stairs. I can even describe the customer room upstairs ( he has a brown medium size wardrobe with designs in front, he has a bluish double base bed which he asked if I could take to rubbish and I explained I have another job after his). his white head boards, His boxes And his heavy luggage filled with books were taken upstairs by me. Is it because I explained to him that I can’t take his old double base bed that he has decided to make a complain? If he said I did not take any thing upstairs, how did we get his bookshelve upstairs? We did that together! Great guy - made the move so easy. Harley was blast and very helpful, thank you so much! Incredibly fast and super friendly! Highly recommend! Harley were very helpful, kind and nice. His diving skills are very good. Extremely recommended! Thank you! Great ride and very positive and fun. Reccomend. The driver was slightly late due to traffic, but called ahead to let me know, and arrived punctually at the rescheduled time. The driver took care in moving my stuff and packing the van, and the drive was smooth. Happy to recommend. Harley was absolutely super. On time, carefully packed the van and drove very safely across London. Brilliant. Friendly and efficient service. We had some awkward shaped objects not yet in boxes and Harley easily found a solution to move them. I would really pleased with the whole process and would highly recommend. Harley is the absolute best. He was very courteous in the delivery of his service and myself and Wife were absolutely wowed. He topped a quick and efficient move off with some fantastic DIY skills in helping with setting up the furniture. Harley all the way! Harley was really helpful and the driver was very smooth. Would highly recommend. Very polite and friendly. Respectful of my personal belongings, very careful with them. Worked fast and efficiently. Slightly late due to traffic, but not so late that it had any effect on the move. Harley was exceptionally helpful; had tools which helped us take apart furniture which proved to difficult to move. He made the whole moving process a lot less stressful; we can’t thank him enough! Superb service. Was only 30 minutes late but rang ahead to let me know so it was no problem. Helped move furniture to the correct floors in the new house and did it in good time. Both guys were friendly and polite. Thanks for the help. Very friendly and helpful driver! Harley was very nice and helpful. We even stopped to pick up a bed on the way which was unplanned. And then he actually helped me put the bed together. Much appreciated. Currently waiting for reply on compensation as we were massively delayed. CMV response: We are very sorry to hear that the driver was so delayed to this booking. We do have a clear refund policy for lateness attached to every booking confirmation, and this customer has been refunded in line with this. Harley was friendly and polite throughout. I needed some packaging taking to a recycling centre, and despite having to try 3 different centres, Harley was patient and helpful. Fantastic friendly service. Would use again.